On the weekend of October 27 we started speaking for the trees! How do you speak for trees you may be asking. Well, we did it using this app called the Open Tree Map app. The open tree map app is an app where people are able to go around their neighborhood or a neighborhood in the city of Boston and document trees. Using this app, you are able to document the type of tree that you see, the size of the tree, and the health/ conditions of the tree. The purpose of recording the amount of trees in the neighborhoods are so that the City of Boston could know if they needed to plant more trees in a certain neighborhood, if they needed to care for a certain amount of trees more or even if they should cut down the tree because it is not a healthy tree. Now to the man who taught us how to use this app and the person who created this app, David. 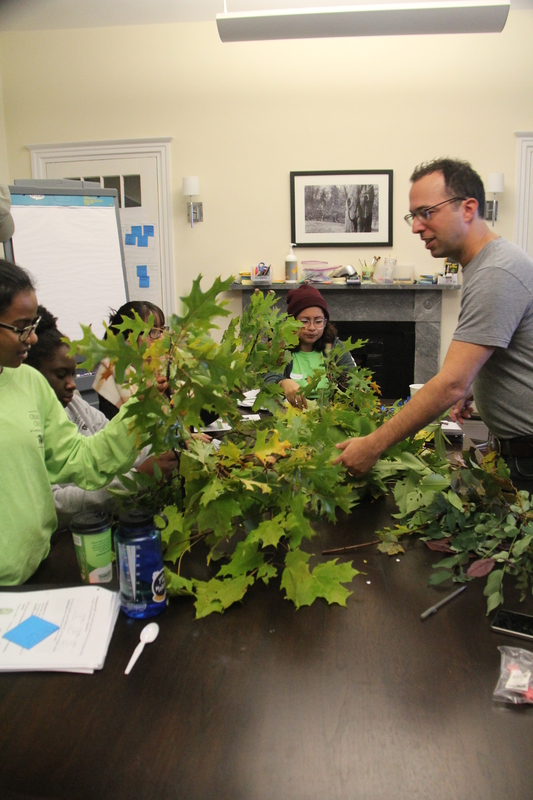 David came to the Navy Yard to help us with his app and to help us with our tree identification skills. We first started by learning why it was important for us to Speak for the Trees, he told us that the trees cannot tell us what it needs so it is up to us to us to realize if a tree is not doing so well and how we can help the tree out. Then, he started to help us identify the trees using the different type of leaves and branches; and let me tell you there are alot of species of trees that we have probably never realized were even there or that there were different maples. Like who knew!! Ok well maybe you did know, but still act excited. After examining theses species and learning all about them hands- on, we went out into the field. David from Speak for the Trees leading us in a tree identification workshop and how to use the app to document the conditions of city street trees. he diameter of the tree using the little tape measures that we were given by David. Then, we went inside and filled out the rest of the information. (Because it was raining and windy) We answered some questions on the app like “The planting site Type”, “The Material Site”, :If here were any wires overhead”, “How much of the tree was Green”, “If there was any pruning done on the tree”, and “Any other features that were found on the Tree”. Lastly, we submitted our document to the app and basically Spoke for the Tree! This day with David and the Trees was really educational and inspiring to all of us at Branching Out. We got to learn more about different types of trees, we got to learn about Tree Identification and we got to have fun in the rain. We also were able to contribute to the improving the tree canopy awareness in Boston with the help of using the Open Tree Map app. We here at Branching Out School year Program hope that you would help contribute also by downloading the app an helping us out. What a great project for the Branching Out team! I wasn’t aware of the city program or the app. Looking forward to learning more about the program!